To those who haven't delved deeply into his considerable body of work, twentieth-century architect, inventor, and futurist Buckminster Fuller seems to have left behind a single lasting contribution to the built environment: the geodesic dome. This I remember whenever I pass by the Cinerama Dome on Sunset Boulevard, a famous movie theater built according to Fuller's sphere-intensive architectural principles. But the fact that you don't see many other geodesic domes these days — you never did see many, I suppose — belies the abundant fruits of Fuller's imagination and know-how. Vigilantly mindful of humanity's potential for a better tomorrow, he also designed a suite of seemingly Utopian, surprisingly innovative, and ultimately unpopular tools for better living. He branded them with a portmanteau of dynamic, maximum, and tension: "Dymaxion" came to stand, or at least Fuller seemed to want it to stand, for unceasing dedication to improving our patterns of life. To that end, he conceived of the Dymaxion House, or "Dymaxion Dwelling Machine," a cheaply mass-producible, naturally heated and cooled, nearly maintenance-free, easily modifiable, and, of course, round housing solution. The satisfied resident of Fuller's future would drive to and from his Dymaxion House, along with ten passengers, in his aerodynamic Dymaxion Car, capable of reaching 90 miles per hour at 30 miles to the gallon. And no matter where he drove, he could find his way with the Dymaxion Map (also known as the "Fuller Projection map"), the only flat whole-earth map with no visual distortions in its representation of what Fuller called Spaceship Earth. 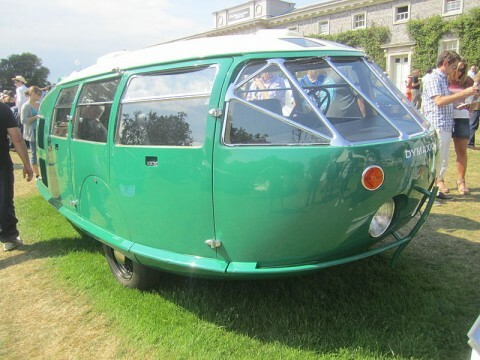 You can see the Dymaxion Car in action, and hear Fuller talk about its development, in the video just above. A 1946 newsreel tour of the Dymaxion House appears at the top of the post. If you now find yourself eager to live according to Buckminster Fuller's ideals, try keeping his ultra-detailed form of a diary, the Dymaxion Chronofile, or taking his periodic 30 minute Dymaxion naps. I know I'd like to get a Dymaxion bathroom installed. Who would I talk to to access the videos shown here with just Bucky talking and none of that music which obscures much of what he is saying.